Ironwood Electronics has recently introduced a new QFN socket design using high performance elastomer capable of 75 GHz, very low inductance and wide temperature applications. The GT-QFN-3024 socket is designed for 10.5×5.5 mm package size and operates at bandwidths up to 75 GHz with less than 1dB of insertion loss. The contact resistance is typically 20 milliohms per pin. The socket is mounted on the target PCB with no soldering, and uses very small real estate allowing capacitors/resistors to be placed close by. This socket utilizes clamshell lid with integrated compression mechanism. 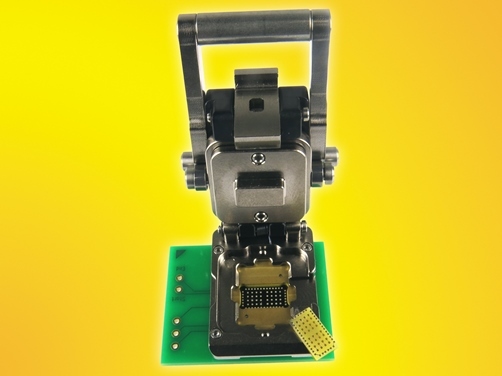 The socket is constructed with cam actuated lever lid with central opening for direct thermal characterization of silicon. To use, place the device inside the socket, close the clamshell lid by latching and apply downward pressure by turning lever. This socket can be used for hand test and temperature cycling as well as debugging application in development and device characterization. The GT-QFN-3024 socket is constructed with high performance and low inductance elastomer contactor. The temperature range is -55 °C to +160 °C. Works with IC’s such as QFN38, 10.5×5.5mm with 26 leads in the length side and 6 leads in the width side with split center ground pad and 0.7mm pitch.